I have only recently been fully aware of the joys of bookmarklets. Of course I had the del.icio.us bookmarklets for quite a while now, but, the idea had not fully sank in until recently. I didn’t “get” bookmarklets. Yesterday I re-discovered Google Reader and with it came its own, very useful, bookmarklet: Subscribe…. 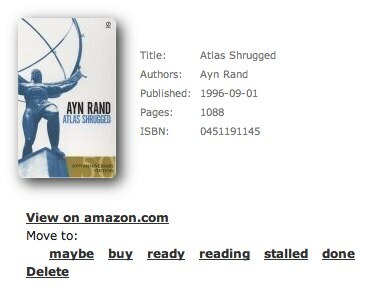 Booktrack is a web application to keep track of the books I read. It keeps track of what I want to read, what I’m reading now and what I’m done reading. This was inspired by librarything.com. This was a spur-of-the-moment idea. A what-if that needed answering. 5 minutes later, I had it and it was working. It is relatively crude, but I’ll take the iterative approach on this one. Now I’m wondering what else I could do with that? What else needs a bookmarklet? What have I missed? This is all part of me trying to keep an eye out for stupid and repetitive tasks.